Huge crowds joined the 10th annual ‘Beat Diabetes Walk’ at Dubai’s Zabeel Park on Friday to raise awareness and funds for diabetes. The event, organised by retail giant Landmark Group, raised hundreds of thousands of dirhams by way of participation fees (Dh20 per adult and Dh10 per child). More funds are being collected through donations at Landmark Group outlets throughout November, which is World Diabetes Month. 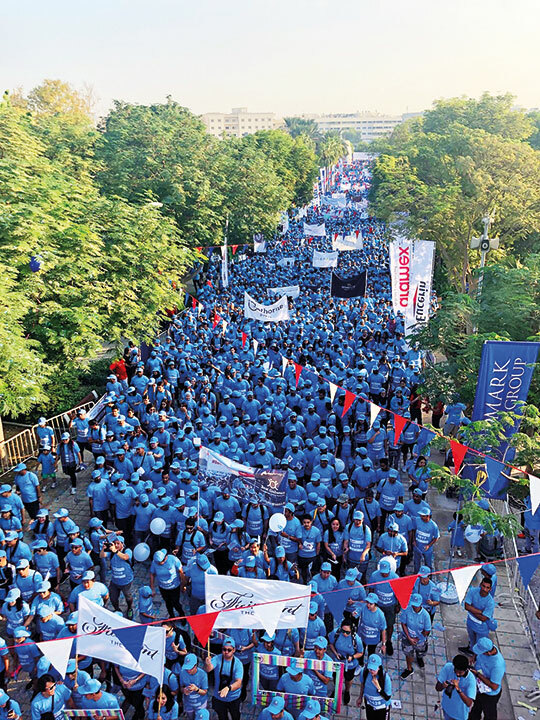 Landmark Group on Friday said over 18,000 people participated in Friday’s three-kilometre walk, bringing the total participation over the decade to more than 100,000 people. Since its inception in 2009, the initiative has also raised over $1 million (over Dh3.67 million) for diabetes care and research. Also, more than 500,000 people have been tested for free to check blood glucose levels through the initiative. Landmark Group has engaged over 700 school and corporates towards the cause. The walk is held each year on the Friday that is closet to World Diabetes Day (November 14). Friday is a weekend off day in the UAE and so more people are able to join community events on Fridays. The funds from the walk will be donated to the event’s official charity partner Al Jalila Foundation, a Dubai-based global philanthropic organisation that will use the funds to promote care, research, and awareness for diabetes, which has no known cure.